The One Million Climate Jobs report produced by the Campaign against Climate Change Trade Union group and backed by eight national unions shows that, for a relatively small amount, we can tackle all these problems. We can create a million secure Government jobs in renewable energy, in increasing energy efficiency by insulating homes and public buildings free of charge, in hugely expanding cheap public transport to get people and freight onto cleaner forms of transit, and in developing the "green skills" that we need through education and training. 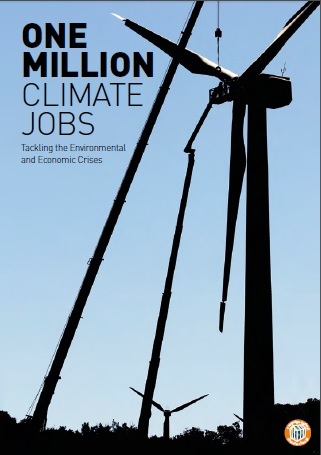 Find out more about how one million climate jobs could bring about a just transition to a low-carbon economy, and what it would mean for our society and our climate, in this fully updated and revised 2014 edition. Read the report online or buy hard copies for £2.50 (or £15 for 10). To find out about the research behind the report read the full companion technical report. NEW flyers available promoting the report and campaign - contact info@campaigncc.org if you would like some sent to you free of charge (download here). The One Million Climate Jobs report is supported by the Bakers, Food and Allied Workers Union (BFAWU), Communication Workers Union (CWU), Fire Brigades Union (FBU), National Union of Students (NUS), Public and Commercial Services Union (PCS), Transport Salaried Staffs Associationa (TSSA), Unite, the union (UNITE), and the University and College Union (UCU). The impacts of climate change are already upon us. We don't have to look hard to see the devastation that is beginning to take hold on peoples lives and the environment across the globe: from the melting Arctic to erratic rainfalls in subSaharan Africa and increased risk of hurricanes and flooding. The figures in this video are not identical to those in the 2014 report, but the message comes through loud and clear. A DVD is available with this video in higher resolution along with a longer (33 min) version with more technical detail.